20% off Fill in special May 14-17!Premium Oceanfront remodelledSpectacular View! Unit 507 is a fifth floor, luxuriously appointed one bedroom condominium at the Kihei (Key-Hay) Surfside Resort, Maui, has a 180 degree absolute direct oceanfront view and the islands of Lanai, Kaho'olawe and Molokini are clearly visible nearby. The unit has been completely remodelled and refurnished. The kitchen has maple cabinets imported from Canada, granite countertops, Professional Series stainless steel appliances including quiet dishwasher (many of the one bedroom units at the Surfside still do not have a dishwasher) and a large side by side refrigerator with water and ice dispenser. The kitchen is fully equipped with a multitude of cooking tools including small appliances and Italian cookware. The living room has a queen size sofa bed with deluxe mattress, built in granite desk with plugs, telephone and high speed internet and wireless internet, wall mounted 37' Vizio LCD TV with DVD/VCR player, stereo with CD player and Ipod dock, and a private lanai. The bedroom has a king sized Sealy Posterpedic bed and a wall mounted 22' LCD TV, telephone and security safe. The unit has a semi ensuite bathroom with granite countertops, and large custom built shower with rain head, hand wand, body sprays and hooks for your wet towels and bathing suits. The unit is fully equipped with utensils, fresh linens and towels, iron/ironing board, hairdryer, beach chairs, beach towels and a cooler. Umbrellas, boogie boards and snorkel gear are not supplied, but are often left behind in the units by other guests – no guarantees. In case the daily trade winds let you down, the unit is equipped with multi-speed, ceiling fans in both the living room and bedroom. Laundry facilities are available on site. The property itself features an extensive and immaculately kept lawn area with dozens of loungers, with a heated swimming pool and deluxe barbeque facilities. In season, there are daily whale sightings from both the grounds and lanais. The building is located at the north end of Keawakapu beach, one of the most beautiful beaches on Maui, where you can walk for miles past some of the most expensive oceanfront homes on the island and the luxurious hotels of Wailea, or swim or snorkel with turtles and a multitude of tropical fish. Kihei Surfside Resort is located at 2936 S. Kihei Road, South Kihei at the entrance of beautiful Wailea. This is the desert part of Maui, where the sun shines more than any other part of the island. The Kihei Surfside Resort consists of an absolute oceanfront concrete building of 6 floors and 84 deluxe units with an elevator. There are two very nice oceanfront restaurants within 100 yards of the resort. The Grand Wailea Hotel, The Shops at Wailea and Wailea/Makena Golf Courses are close by and Kahalui airport is just twenty-five minutes away. Rental cars are available at the airport or in Kihei town. There is free parking on site. Just a few minutes from the airport are Costco and Wal-Mart. A short drive from the resort is Safeway, Foodland and Star Market, where you can stock up on groceries. Right across the parking lot from the Surfside is an upscale deli/grocery store for last minute items, and a yoga studio. The world class golf facilities of Wailea and Makena are nearby. Windsurfing, and many other water activities are also available nearby. Some of the best snorkeling on Maui is steps from the property. The Pacific Foundation conducts their annual whale count from the Surfside property. The Kihei boat ramp, from where the pleasure boats and sightseeing/snorkeling tours depart, can be seen from the lanai and is a two minute walk. Larry and Sharon Rosenberg are businesspeople from Vancouver, Canada. We started coming to the Kihei Surfside on our honeymoon in 1983. We loved it so much we returned every year. We feel very fortunate to be owners at the Kihei Surfside. The Surfside is a special place - our favorite on earth - and we enjoy helping first timers discover this magical place! We plan to spend our winters at the Surfside once we retire. We are convinced this property offers the best value and location for oceanfront accommodation in the south Kihei/Wailea area. All of the units are direct oceanfront, and the property has the most amazing oceanfront lawn area spanning over 2 acres, which is unique to our property. The best part about the Surfside are the friendly, happy people, and the great accommodating staff! The property is located right at the north end of world famous Keawakapu Beach. It is one of the finest white sand beaches anywhere. It stretches for miles past some of the most expensive homes and hotels in all of Maui. Great for walking or running. There is a reef right at our property that has the most amazing snorkeling we have seen anywhere. Unlike most other oceanfront properties in Kihei, the Surfside is perched right on the sea shore, set back several hundred feet from S. Kihei Road, so you hear the ocean, not the road noise. The complex has two high end stainless steel barbeques and picnic tables right at the ocean. Almost every night, we use the barbeque and eat our dinner at the oceanfront lit by tiki torches. Haleakala National Park is home to Maui's highest peak. Rising 10,023 feet above sea level, Haleakala's graceful slopes can be seen from the south side of the building. Haleakala means 'house of the sun' in Hawaiian, and legend has it that the demigod Maui lassoed the sun from its journey across the sky as he stood on the volcano’s summit, slowing its descent to make the day last even longer. The unit has a completely unobstructed view of the Pacific Ocean and the West Maui Mountains. The Pacific Whale Foundation uses the property to conduct its annual whale count! Great location. Great view. Missing it already! Great location in Kihei. Very clean and comfortable. Would stay here again if back on Maui. This perfect spot is located right on the beach, with an amazing view of the water and all the activities going on outside. The pool is in excellent condition and very inviting, and the beach, which is only about a minute walk away, is lovely. We especially loved that this condo was located quite central to everything (it is one of the last properties in South Kihei before you hit Wailea), and so every beach was easy to access. Lots of restaurants and sites to walk to, but the condo was not part of the busy strip in Kihei, so was nice and quiet. The condo is in excellent condition. Would have loved to have had some beach chairs to take to all the different beaches, and/or an umbrella, but these are just top extra's. We would definitely come back again. Great Location and great Condo, great Value. Excellent Views! Best spot for Sunset! Condo was nice and quiet. All the people at the Resort are friendly and helpful. Owner was excellent to work with, no surprises, and very responsive. This condo needs new or repaired kitchen chairs (the center of each chair feels like you’ll fall through), sofa, king sheets, pillows, dish towels and cloths, headboard wicker cleaned (coated with dust). We enjoyed our stay immensely but for the price paid these items should be addressed. This was our 3rd stay in KS507. We love the open green lawn, the great views and the lounge chairs that look out on wonderful sunsets. 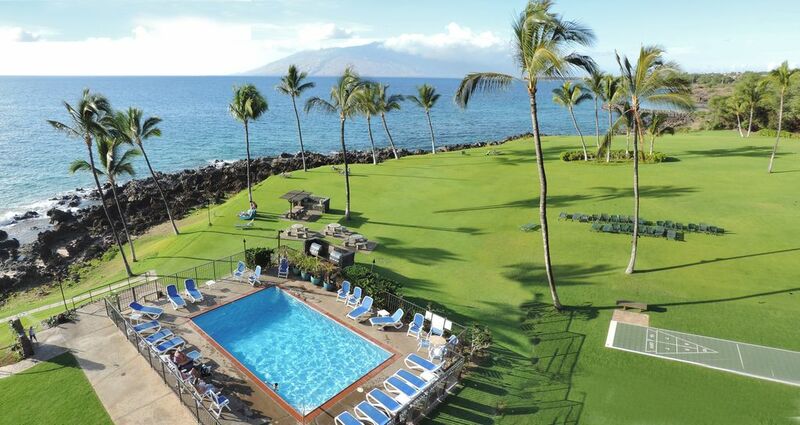 The Surfside is a quiet complex that is perfectly situated between Wailea and Kihei. The actual unit is finely appointed with new fixtures and updated countertops. The bed is comfortable, and the rain shower is a welcome sight after a long day adventuring! Larry is a great host--very communicative and kind. Mahalo for another fabulous trip. We will be back! we return each year, so that is probably enough of a review and indicator that we love this place. I actually am hesitant to write a review explaining our pleasure as I want to keep this place open and available for just us (Lol). The description of the property was accurate, everything was accommodating and it was again just perfect. Another unique feature of the property is that we have a 2 acre, immaculately kept oceanfront lawn area with dozens of loungers, with a heated swimming pool and deluxe barbeque facilities. In season, there are daily whale sightings from both the grounds and lanais. In fact, the Pacific Whale Foundation conducts their annual whale count from our property. The building is located at the north end of Keawakapu Beach, one of the most beautiful beaches on Maui (voted Maui’s most romantic), where you can walk for miles past some of the most expensive oceanfront homes on the island and the luxurious hotels of Wailea, including the Grand Wailea Hotel. It is customary for the residents of the Kihei Surfside to gather each evening for cocktails on the shore near the tiki torches for a traditional Hawaiian sundown ceremony. Feel free to join in – everyone is welcome - this is a great opportunity to meet your neighbors and fellow vacationers! There are two very nice oceanfront restaurants within 100 yards of the resort; the Five Palms and Sarentos on the Beach. The Five Palms is known as the best happy hour on Maui, the bar menu and drinks are half price between 5 and 7:30PM, and after 9PM. Right across the parking lot from the Surfside is an upscale deli/grocery/wine store, Zach’s. Other larger grocery stores in Kihei, a short drive from the resort are Safeway, Foodland and Star Market. The island also has a Costco, Wal-Mart, K-Mart and Sears. There is never any shortage of things to do on Maui. The Shops at Wailea, Wailea Golf Club, Wailea Tennis Club and Makena Golf Club are within a five minute drive. The Kihei boat ramp is located 100 yards north of the property. Several of the tour operators for snorkeling and diving launch here. See Maui Dive Shop, Makena Coast Dive Charters, and Blue Water Rafting. Maalaea Harbor is a 20 minute drive, and from there you would get the fishing charters and sunset dinner cruises, or visit the Maui Ocean Center. The old whaling town of Lahaina is a 45 minute drive; from there you can ride on the Atlantis Submarine, or go for a boat trip with the Pacific Whale Foundation. Helicopter tours are available from the airport. See Blue Hawaiian Helicopters or Air Maui. Feeling adventurous? Try riding a bike down Mount Haleakala - Haleakala Bike Company. For exercise enthusiasts, there are a couple of gyms nearby – Powerhouse Gym, Valley Isle Fitness, and Pilates Maui. There is also an oceanfront yoga studio Maui Yoga Path right across the parking lot. We think this property has the best location in Kihei! THIS IS A HAWAII TRANSIENT ACCOMMODATIONS GOVERNED BY HAWAII LAW. HAWAII TRANSIENT ACCOMMODATIONS TAXES MUST BE PAID ON THE GROSS RENTS COLLECTED BY AN OPERATOR FROM ANY PERSON RENTING HAWAII TRANSIENT ACCOMMODATIONS. HAWAII LAW ALSO PROVIDES FURTHER REQUIREMENTS OF A TRANSIENT ACCOMMODATIONS OPERATOR. Hawaii Tax # TA-213-453-4144-01 $95 cleaning fee to be applied to reservation. Rates are for up to 2 adults and two children (18 and under). $10/nt fee per person applies if more than 2 adults in the unit. Maximum 4 people. Changes: There is no guarantee that changes can be accommodated - check first! Permissible changes within 48 hours of booking are free; Permissible changes after 48 hours of booking may result in a $25 fee.